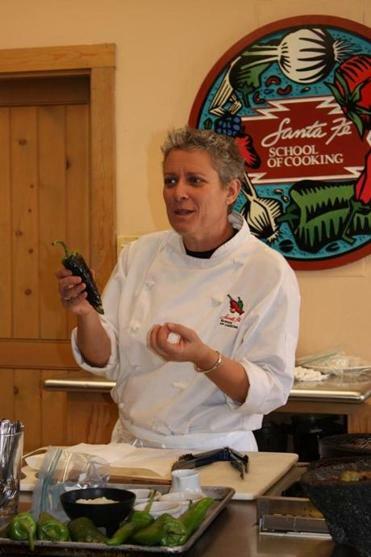 Deena Chafetz teaches a chili workshop at Santa Fe School of Cooking. “We put them in everything and on everything; it’s what makes our cuisine special,’’ explains Deena Chafetz, a chef and teacher of the “Chile Amor’’ class at the venerable Santa Fe School of Cooking. After this 90-minute workshop, which costs $50 per person, you are in a better position to decipher menus, know what’s in chili-infused guacamole, carne adovada (pork marinated in red chili), pizza with green chili sauce, and green chili beer. Early on, you can get what we call “chili chap’’: chapped lips from low humidity further irritated by hot food, certainly a rite of passage for any visitor from a more humid climate. We are 16 students from around the country, unified on our most burning question: Which is hotter, red or green? Her answer: It depends. We learn that green chili sauce is always made from fresh roasted and peeled peppers (they can be frozen after roasting), while red sauce is made from either dried chili pods or chili powder. We divide into groups and work at cooking stations to grill, peel, and dice green peppers, adding them to an onion and garlic mixture, and we make two red chili sauces, one from powder, and the other from pods. We sample them all on homemade tortillas. Santa Fe School of Cooking 116 West San Francisco St., Santa Fe, 800-982-4688, www.santafeschoolofcooking.com. Classes start at $50 per person; market on site. Santa Fe Farmers’ Market 1607 Paseo De Peralta (Santa Fe Railyard), Santa Fe, 505-983-4098, www.santafefarmersmar market.com. Open Sat and Tue, 8 a.m.-1 p.m.